I was in New Delhi, India, enjoying a ratatouille crepe of all things for an early lunch when I received the devastating news. ‘A massive earthquake just hit Japan, is your family okay?’ a concerned friend informed me, and my leisurely day of shopping quickly changed into an afternoon of panic, fear and heartbreak. I frantically phoned home, only to get an automated Japanese message saying that phone lines were crowded and to hang up and try again. There were no TV screens where I was, and in the car ride home, my imagination went wild as to exactly what happened. How big was the earthquake, where did it hit, and where is my family? Lack of information led to more fear as I prepared myself for the worst. It was March 11, 2011. A 9.0 magnitude earthquake shook Northern Japan, triggering destructive tsunamis that wiped out many towns along the Pacific coast of Japan. This Tohoku earthquake was the strongest earthquake to have ever hit Japan, rattling this small island country that was highly prepared to deal with any earthquake but never for one this strong. Buildings cracked and crumbled, coastlines shifted, streets caved in and towers leaned, but those initial few minutes of earthshaking were nothing compared to what was about to happen. In the calm before the storm, people retreated back to their homes to gather belongings and assess damage, a move that would prove fatal for those who would fall victim to the powerful tsunami that came pounding down like a hammer. Once back home at my brother’s house in New Delhi, my heart broke into a million pieces at the horrific images that were coming through the screen. 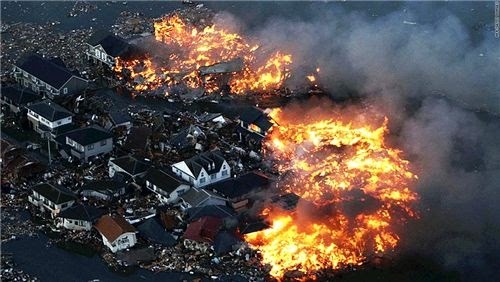 Entire villages being engulfed by the tsunami within seconds, people trapped in cars that were being swept away, roaring fires spreading into a blazing inferno, boats smashing into buildings and dissipating like dust, lively fishing villages reduced to piles of debris. Such images took me back to last year’s Haiti earthquake, only this time it hit closer to home. It took several hours for me to get in touch with my mother, who cried over the phone every time a strong aftershock overtook the house. My father, who was unreachable for 6 hours, finally made it home at midnight after walking through the deserted streets of Tokyo. All relatives and friends were eventually confirmed safe and unharmed, but I was already shattered with grief and sadness. Meanwhile, in Rikuzentakata, Miyagi prefecture, Japan, one man stood dumbfounded in front of a pile of debris that was once his artisanal sake brewery. Yasuhiko Konno, the owner of Suisen sake, narrowly escaped the tsunami that completely wiped out his brewery, destroying with it his prize winning hand-brewed sake plant and more than 200 years worth of history. This respected community figure who produced some of Japan’s most famous sakes lost everything- his family tradition, his house and even 11 of his 67 loyal employees at the brewery. These 11 deaths would join the appalling statistics of the Tohoku casualties: 14,133 deaths, 5,304 injuries and 13,346 people still missing. Many people continue to die from post-earthquake related factors, such as exposure to cold weather, communicable diseases and infections, unsanitary conditions and inability to receive adequate medical care for pre-existing conditions. The earthquake and tsunami caused extensive and severe structural damage, including heavy damage to nuclear power plants, a grave problem that still remains an active issue. Japan declared a state of emergency following the failure of the cooling system at the Fukushima power plants, mandating a massive evacuation and resulting in worldwide radiation fears. The Japanese sake industry was not spared in the natural disasters either. 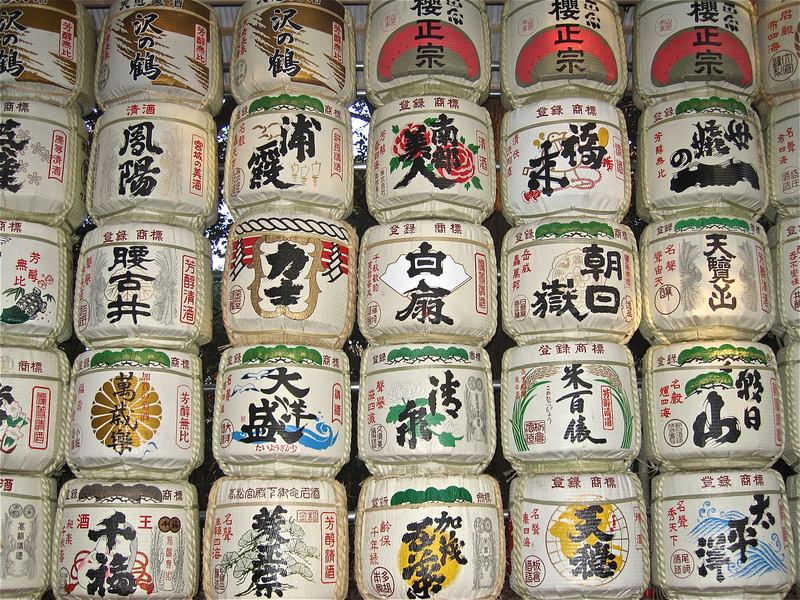 Sake has been an important part of Japanese culture for the past 2000 years, playing a central role in religious and spiritual ceremonies as a symbol of purity, good fortune and new beginnings. 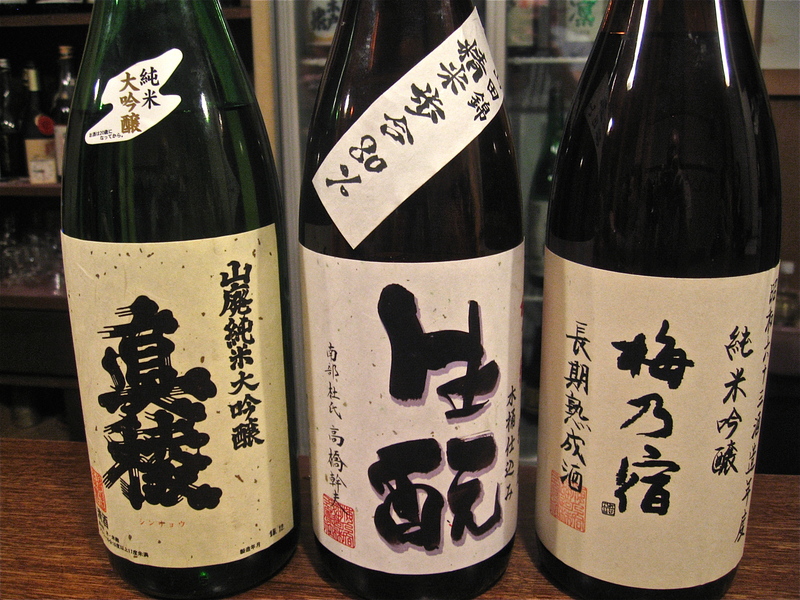 Sake breweries in Miyagi prefecture, the epicenter of the earthquake, and Iwate and Fukushima prefectures were the hardest hit, many of them small family owned breweries that produce some of the most highest quality aromatic sakes. Yasuhiko Konno’s story is just one of many, with over 200 sake breweries affected and at least 10 being completely wiped out. Even as a child growing up in Japan, I drank sake as a part of ceremonial rituals. Sake is often consumed as a part of Shinto purification traditions, such as on New Year’s Day when the entire family, even children, sip on otoso to flush away the previous year’s bad fortunes and bring in the new. 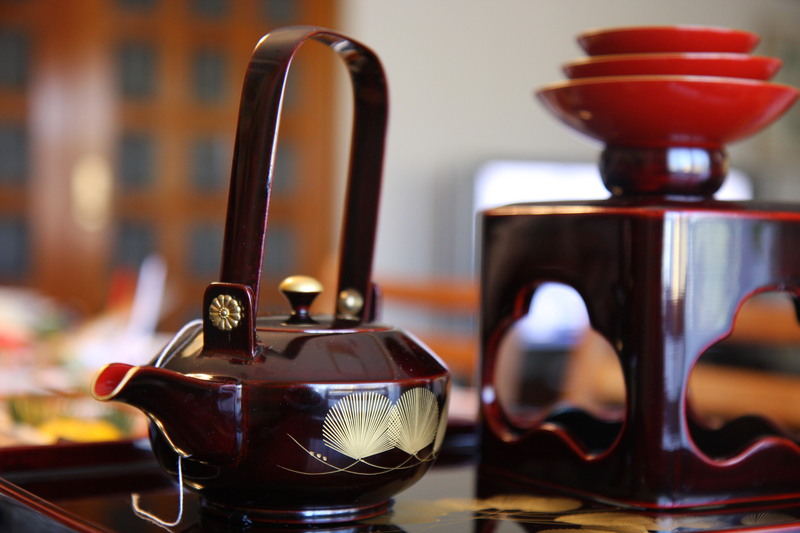 Otoso is served in beautiful lacquered sets and passed around from the youngest to the oldest in the family. At Shinto shrines, people offer sake to gods to solicit rich harvests and blossoming businesses for the coming year. In a ceremony called kagami biraki, large wooden sake casks are split open with wooden hammers during weddings, store openings, sports events and other celebratory occasions. During World War II, kamikaze pilots even drank sake prior to their missions in a last salute of loyalty to the Japanese Emperor. 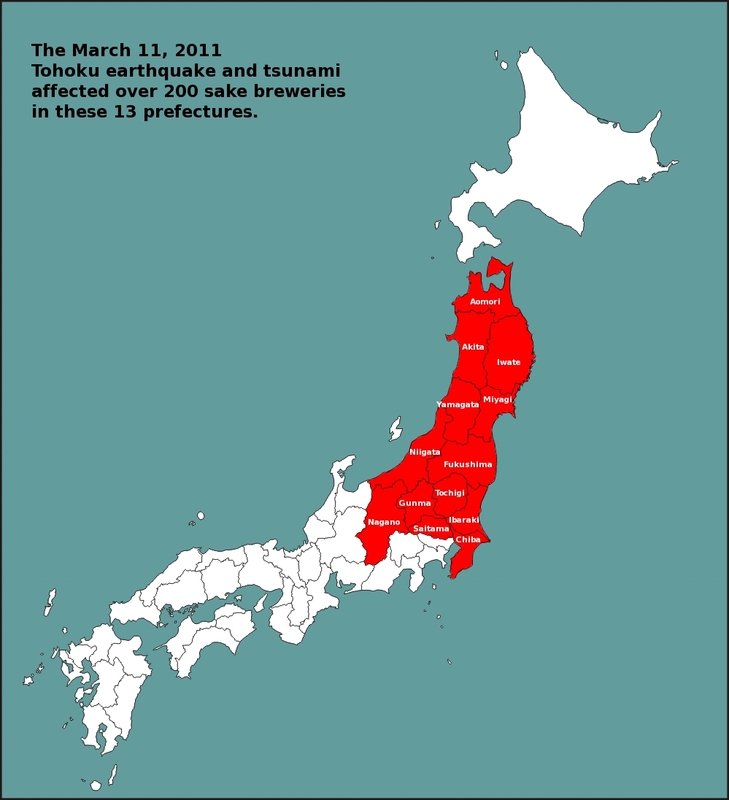 Over 200 sake breweries were affected in some way in 13 prefectures, although the hardest hit prefectures were Miyagi, Iwate and Fukushima. For more detailed information on which breweries were affected in what way, you can click on this link to ‘Sake Samurai’ John Gauntner’s report. Perhaps the next time you go to buy or order sake for your dinner, you can consciously choose one of the Tohoku brands to show your support. It’s a tradition in Japan to eat a certain assortment of foods called ‘osechi’ on New Years Day. It’s an assortment of all types of beans, fish, meats, and vegetables which all require a painstakingly long and elaborate preparation process. Each type of food has a special meaning, so eating it will grant you that good fortune. All of these foods are cooked in such a way as to last for a few days (not immediately perishable), so they can be eaten without refrigeration during the first few days of the new year. This is so that people (well, women) can take a break from the kitchen and enjoy the new year. As most Japanese cuisine goes, the food is just as beautiful to look at as it is to eat, and they are displayed in elegant lacquer boxes. These boxes usually have 3 levels, each overflowing with lots of delicious food. The little fish in the top corner are soy sauce stewed baby anchovies (tazukuri), and they symbolize good harvest. The lobster in the middle is for extravagance, and it also symbolizes longevity, supposedly because long antenaes on the lobster make it look like an old man. The black beans (kuromame) in the front symbolize diligence and living each day with humility. The gold flakes are sprinkled on for that extra ‘bling’ effect. The yellow wedges above that which look like orange wedges are pickled herring roe, or kazunoko, which symbolize fertility. The seaweed wrap in the upper right hand corner symbolizes happiness and joy. The orange and white stuff in the blue bowl in the front is pickled radish and carrots- supposed to symbolize and celebrate the white and red of the Japanese flag. On the left is sake steamed abalone, a popular delicacy in osechi. Interestingly, the cooked lotus roots symbolize a good future, because you can look straight through all of those holes right into the future. Every little item in these boxes are made with a certain intention- whether to bring wealth, longevity, good fortune, or to promote health and happiness. This is a wonderful Japanese New Years tradition that most families celebrate. After we eat this food, we drive over to the shrine and get our blessings for the new year. Random trivia: Did you know that lobster blood is colorless (clear) and flavorless?